Generally, my skin tends to behave itself. From time to time, I’ll get the occasional breakout (which isn’t really a big deal) and I’ll just ride it out. Since I don’t wear foundation all that much, I feel that any attempt at camouflaging the blemish will make it look even more noticeable. Besides, using makeup on a pimple skeeves me out. Eventually, it’ll go away on it’s own. When I’ve got an important event coming up, that’s when it escalates into a problem. I’m not interested in covering it up. I want it gone, asap. To that end, I’ve tried and will continue to try anything and everything that promises to do that. One method I’ve tried is using toothpaste (which contains hydrogen peroxide, baking soda, alcohol, etc…) to supposedly dry out the pimple. I’ve used a handful of products from the Tea Tree Oil range (targeting pimples and other blemishes) from The Body Shop. I’ve used several on-the-spot treatments from Neutrogena. I’ve even used those Japanese Acne Patches. To date, the most effective product I’ve ever used, with the quickest results ever, was the one I got for free (every area in Kuwait has a free local clinic) but is also sold in most pharmacies in the country. The product was a black balm that came in generic all-white packaging in tub form, with a screw-on lid. My mom first introduced it to me after I discovered the joys of dry shaving. I was new to the world of shaving and didn’t know any better which consequentially led to the pimple forming in my underarm. This wasn’t just any pimple. This was the mother of all pimples. It was huge, painful, and embarrassing. I refused to go in to see the doctor at our local clinic (because like I said, embarrassing) so my mom went in, instead. She came out with a prescription from the doctor, and we picked up the balm at the pharmacy. I applied the balm to the pimple and went to bed. I could feel it working almost instantaneously. The pimple doubled in size as I slept and kept on growing. When I woke up, it had already popped. In the interest of full disclosure, it did leave a tiny scar behind (that has faded over the years) which never bothered me (because it’s in my armpit so like who cares?). I don’t think I’d be too happy about the scar if it was on my face though which is why I’m still looking for a better alternative. In come in these two, Clean & Clear Persa-Gel 10 (10% benzoyl peroxide acne medication) maximum strength and Clean & Clear Advantage Popped Pimple Relief Drying Paste (salicylic acid acne medication). I purchased them as an alternative to the cult-classic Mario Badescu Drying Lotion but I haven’t used them yet so I’ll get back to you and let you know how effective they are once I do. Although dermatologists do not recommend intentionally popping pimples (and you know it’s not the best thing for your skin), they can inevitably end up getting popped. 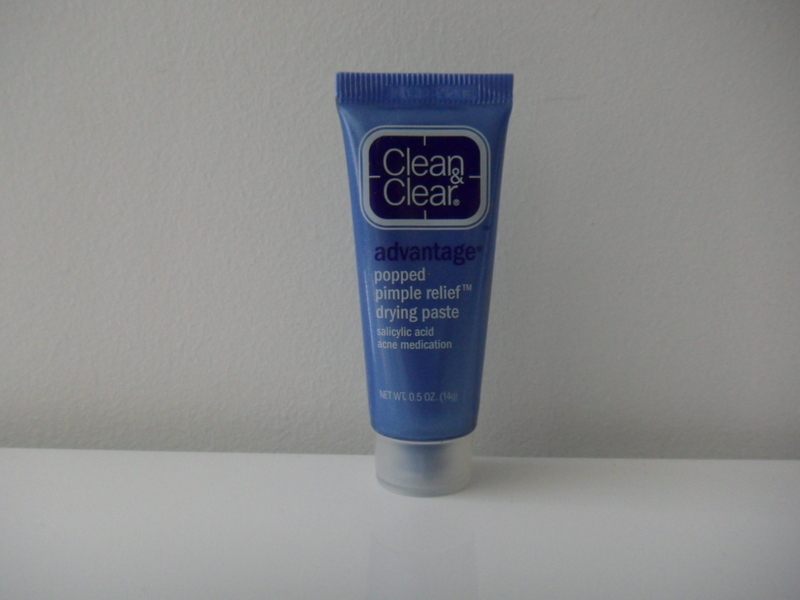 The Clean & Clear Advantage Popped Pimple Relief drying paste is specially formulated to target the unpleasant appearance of acne blemishes, including popped pimples. The drying paste goes on blue then turns white so you know it’s dry and starting to work.